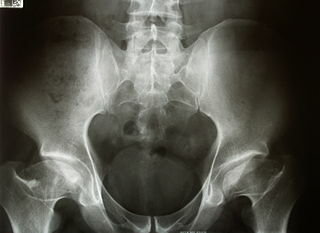 Idiopathic osteonecrosis of the femoral head in a skeletally immature patient, is characterized by necrosis of the ossific nucleus of the femoral head secondary to occlusion of the arterial or venous blood supply. After infarction, healing occurs by creeping substitution and resorption of the dead bone. The resulting deformity of the hip joint may be extensive and can exceed the remodeling and healing capacity of the developing epiphysis. Patients with Legg Calve Perthes disease present with pain in the groin, thigh, or knee region. Onset usually is insidious, and the patient may be symptomatic before presentation. Most children have a Trendelenburg gait. Internal rotation, abduction, and extension of the hip are limited. Plain radiographs are essential for diagnosis and can be predictive of outcome. Several classification systems have been proposed, including the Caterall, Herring, Salter, and Waldenstrom systems. All these classification systems used different graduated radiologic criteria to assist in predicting outcome. 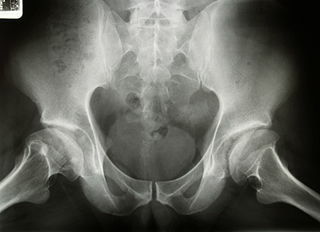 “Head at risk” signs have also been proposed to help predict outcome and include Gage’s sign (a radiolucent wedge defect on the lateral side of the epiphysis), calcification lateral to the epiphysis, lateral subluxation of the femoral head, a horizontal physis, and metaphyseal cysts. Treatment is based on containment of the avascular femoral head within the acetabulum to allow healing and remodeling of the affected cartilage. Restricted activity and limited weight-bearing can help control the symptoms and prevent further deformation of the femoral head. The most important factor for healing is age and amount of femoral head involvement; younger patients with little deformity have a better chance of normal cartilage development. During the treatment period, it is essential that range of motion of the hip is preserved and aggressive physical therapy is warranted. Treatment is continued until plain radiography shows reossification of the ossific nucleus and lateral coverage for the femoral head, and the patient is symptom free. Long-term risks in athletes with Legg Calve Perthes disease include the risk for early arthritis secondary to the amount of residual femoral head collapse. Patients are prone to overuse syndromes because of joint incongruity. Physiotherapy interventions have been shown to improve ROM and strength in this patient population. Patients demonstrate greater improvement in muscle strength, functional mobility, gait speed, and quality of exercise performance. Focus on strengthening of hip abductors, hip flexors, hip external rotators, hip internal rotators, hip extensors, or any other lower extremity muscle group that displays significant strength deficits. Special attention is to be given to the gluteus medius in order to minimize intraarticular pain and for pelvic control during single leg activities and ambulation. Follow the referring physician’s guidelines for weight bearing status. Begin gait training with the appropriate assistive device given weight bearing status as determined by the referring physician or based on the patient’s tolerance to full weight bearing due to pain or safety. Surgical treatment during the acute disease can help to control symptoms and to contain the hip. Hip arthroscopy has been shown to be therapeutic for patients with Legg Calve Perthes disease. Removal of loose bodies and debridement of cartilage flaps provide most of the therapeutic benefit. Other operations include a wide spectrum of femoral osteotomies, acetabular osteotomies, and shelf procedures, with the goal of providing containment for the femoral head. Kim HK. Legg-Calvé-Perthes disease. J Am Acad Orthop Surg. 2010 Nov;18(11):676-86. Manfred Nelitz, Dr. med., Sabine Lippacher, Dr. med., Rüdiger Krauspe.Perthes Disease-Current Principles of Diagnosis and Treatment. Dtsch Arztebl Int. Jul 2009; 106(31-32): 517–523.